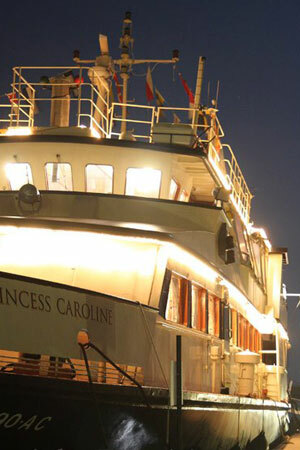 Princess Caroline has two decks, the middle bridge deck provides a spacious restaurant and dance area. The upper deck provides a versatile area that can be closed to the elements or opened up in the summer months to give a stunning platform from which to enjoy the ever changing panorama. A separate restaurant and dance area is on the middle and bridge deck. Combined, the decks provide comfortable accommodation for 120 guests. The mixed ambiance of soft wood tones blended with the nautical essence that only a ship of character can provide will provide the perfect setting for you and your guests. We already had many years of experience in the boating industry as we had just sold our successful Yacht Brokerage in Portugal. Back then we enjoyed a gentle life working together & bringing up our children up in the local area. Jay was brought up surrounded by boats as his father had a an extremely successful Restaurant, Hotel & Marina in Loosdrecht, Holland.The Restaurant – T’Kompass was extremely popular and would frequently have double sittings of 100-plus guests of an evening. Andi had lived and worked in South of France where she learnt to cook under a Parisien Chef and sailed around the Mediterranean and over to the Carribean working for private owners of pleasure yachts. We first met when we worked together in Holland for Jay’s father. We used to love working in a16th Century Party House called ‘Het Reght Huis’ which held up to 450 guests – this also meant often having up to 3 different events going on under the same roof. That certainly kept us on our toes! We would also work on a friend’s sailing boat which he chartered for corporate groups – Andi would always suggest that she should do this job as it was a firm favourite !! There really is nothing more enjoyable than sailing around on a beautiful day whilst working !! In fact we also married on a boat with guests present whilst we sailed on the lake before going on to Het Reght Huis for our wedding reception ! We had further experience in a famous Michelin Star Restaurant – De Hoefslag in Holland. Once we put all of these experiences together it was the obvious solution to put the Princess Caroline into action, combining all of our joint experience. However first of all Jay had to renovate the ship with a team of workers which began in Portugal and was then was finally completed in Holland more than a year & half later. Jay remains constantly vigilant to the maintenance of the ship and is one of the several Captains on board. Andi runs the office and all of the events on board to make sure that it is a smooth show with fabulous food & service! Andi creates all of the menus and meets each of the clients to discuss and organise how they would like their event to go. Even our sons can often be found working as well ! It was incredibly scary investing everything that we had & moving to a different country where we didn’t even know anyone to begin not only a new business venture but also a new life adventure ! Once we got into action it all felt like it was moving in slow motion…. gradually doors started to open and guests would come to try us out. Here we are 12 years on and the repeat business is fantastic. There are many occasions when it’s just so nice to see a familiar face back again and have a catch up on what we’ve all been up to since the last time they were on board. Best of all is not only the variety of guests who come on board but also guests who begin as a corporate client who then go on to celebrate either their wedding, anniversary , birthday or retirement on a more personal level ! We couldn’t have acheived all of the reputation that we have without a fantastic team behind us who work really hard. We don’t charge a service charge but our staff are always very appreciative of any tips in recognition of their hard work. Along side that we’ve established a wonderful portfolio of entertainers, florists, cake makers etc. of all descriptions who work really well with us in providing a professional and highly appreciated service. That makes our ship run so well as it is each cog in the wheel that has to be well oiled & smooth. Weddings are notoriously stressful. It doesn’t matter what your religious background is; the anxiety over finding a dress, securing a venue, choosing a florist and figuring out the guests’ seating chart is enough to make any couple wish they had eloped. Jewish wedding traditions, however, tend to keep betrothed lovers grounded and focused on the commitment they’re about to make to each other and to God. The long-standing customs, traditions and gleeful celebrations at most Jewish weddings are sure to make even the most jaded guests smile. The Princess Caroline MS, Town Quay, Southampton is the perfect venue to host not only your ceremony but also the evening celebrations. A group of people who have been to a wedding are on their way home. One says “it was a great wedding. The music was marvellous. “Still another one says ” it was the best wedding I ever went to. I saw all my good friends there and we had a terrific time .” Rabbi Nachman, who has overheard them, says’ those people weren’t really at a wedding. Then another wedding guest joins this group and says “Baruch Hashem ! (Blessed be the name!). Thank God those two got together!’. at that Rabbi Nachman says “Now, that person was at wedding!”. It is the wish that everyone who attends your wedding – family and friends, witnesses and guests, even bride and groom will go home talking about the good food and the good time, and the fact that you two found each other and decided to invoke the blessings of family, friends, community and tradition on your love. Our highly trained chef is able to cater for your specific requirements, accommodating Kosher Style menus and working to meet your every need. With an ever changing scenery, cruising the Solent with the roof open and the sides up – brings you closer to the elements and with the sun shining or the stars twinkling as you and your guests celebrate – creates magical moments in a venue that cannot be rivalled. 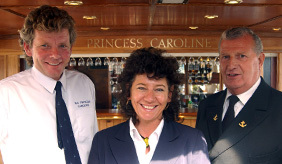 If you want to keep to tradition and do something a little different the Princess Caroline is that venue. Smashing the Glass and dancing celebrations onboard our Promenade deck, fine dining in the restaurant, will give you and your guests that intimate moment of sharing your special moments. Call us to view our boat and picture your dream wedding.